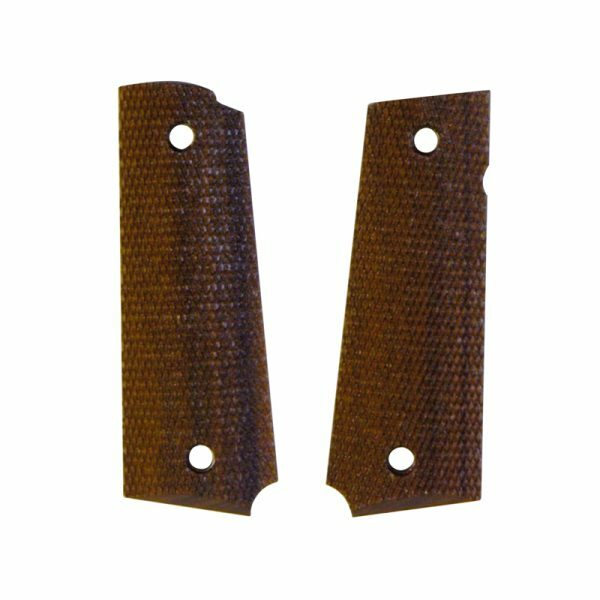 Colt 1911 Walnut Checkered Grips - Vintage Gun Grips - Reproduction Pistol Grips, Buttplates and Grip Caps. interchangeable. During the war times, contracts for manufacture were given to Caron Brothers, Canada, North American Arms Co., Canada, Singer Sewing Machine, Union Switch and Signal, Ithaca Gun Co., Colt, and Remington Rand. Remington Rand appears to have been the largest producer, over a million units from 1942 to 1945. Production for the civilian market had a C preceding the serial number. In 1933 a variation called the National Match was produced, hand fitted and tested with tighter tolerances and adjustable sights. This model was discontinued during WW II, but reappeared in 1957 as the Gold Cup model. In 1949, an alloy receiver model was introduced as the Commander. Weighing 26.5 oz., It had a barrel 3/4″ shorter, and a rounded hollow hammer. All models use the same magazines. The magazines also fit the Argentine, Chinese and American copies. Production totals appear to exceed 3,000,000 units.